L and N Racing’s Lookin At Lee had his final breeze for Saturday’s Grade 1 Travers at approximately 6:00 a.m. Monday, negotiating a steady half-mile in 50.99 seconds over the Oklahoma training track with exercise rider Angel Garcia aboard. The move was good for 54th of 75 at the distance. 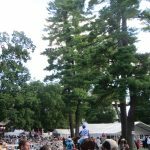 The Steve Asmussen-trained Grade 1 Kentucky Derby runner-up recorded the same drill in 51.59 one week ago and exits a third in the Grade 3 West Virginia Derby on August 5. It was a big morning for the Asmussen stable, with stable star and three-time Grade 1 winner Gun Runner worked just prior to Lookin At Lee, shooting a bullet five furlongs in 1:00.40, the fastest of 11. Regular pilot Florent Geroux was in the saddle and will have the return call in the Grade 1, $750,000 Woodward on September 2. The Asmussen barn has gone 9-4-2-0 in the last week of racing. After sending out the last of his workers over the Oklahoma turf course and without a horse entered on Monday’s program, trainer Kiaran McLaughlin spent a few minutes back at the barn searching the Internet for the meaning of Fayeq, Shadwell Stable’s improving 3-year-old that will make his stakes debut in Saturday’s Grade 1 Travers. It is a question McLaughlin has faced numerous times before with Shadwell horses such as Hall of Famer Invasor and other Grade 1 winners such as Lahudood, Jazil and Tamarkuz and, most recently, with multiple graded stakes winner Mohaymen. Other than discovering Fayeq is an Arabic boys’ name, McLaughlin’s search was unsuccessful. Fayeq continued his Travers preparations galloping 1 3/8 miles over Saratoga’s main track Monday under exercise rider Rob Massey. McLaughlin said the half-brother to Hall of Fame mare Rachel Alexandra will gallop each morning into the race. Fayeq has won his last two starts, each under jockey Luis Saez, who will ride the Malibu Moon colt back in the Travers. Both his June 11 maiden victory and 3 ½-length allowance score July 26 at Saratoga going 1 1/8 miles came against older horses; Grade 3 winner West Coast is the only other of 12 projected Travers starters to have faced his elders, taking an optional claiming event in May at Santa Anita. Unraced at 2, Fayeq debuted with a third-place effort behind Timeline and Giuseppe the Great in a seven-furlong maiden special weight March 4 at Gulfstream Park. Timeline went on to win a pair of Grade 3 races while Giuseppe the Great graduated in his next start and was second in the Grade 2 Woody Stephens and Grade 2 Jim Dandy and will make his Grade 1 debut in the Travers. “He came in to us late. They took their time with him. We received him October 11 so that’s why he wasn’t anywhere early on,” McLaughlin said. “Then we had a gate issue with him, but he’s doing really well and he’s come on a lot. It’s a tough spot but we’re here and we’re going to try. 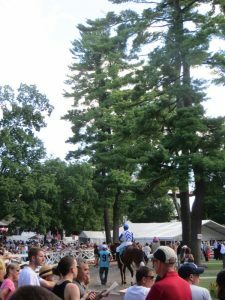 McLaughlin isn’t concerned with what post position Fayeq gets at Tuesday evening’s draw in downtown Saratoga Springs. 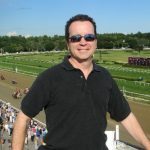 He broke from post 7 and 4 in each of his two victories, where he stalked the pace before pouncing at the top of the stretch to win by a combined 6 ¼ lengths. Alpha gave McLaughlin his lone Travers win in an historic dead heat with Golden Ticket in 2012. Saez will be riding in the Travers for the third time, winning with eventual 3-year-old champion Will Take Charge in 2013.